With over 32 years of experience in general & cosmetic dentistry, Dr. Briscoe DDS offers unparalleled expertise to get your teeth and gums into the best health of your life, no matter what your dental concerns may be. 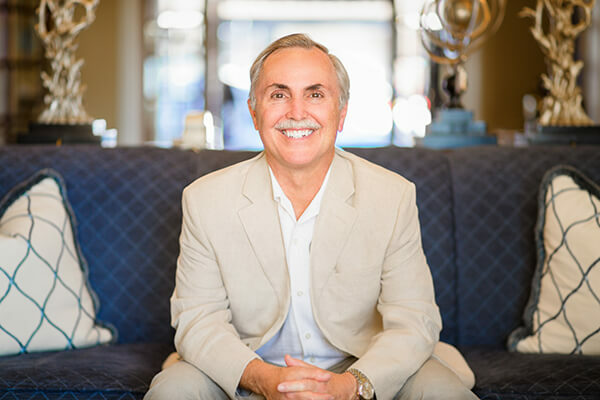 Award-winning La Jolla Cosmetic Dentist, Charles Briscoe, DDS is a highly-trained and knowledgeable dentist with more than 32 years of experience in his field. With thousands of hours of advanced training in dental specialties, including cosmetic dentistry, implant dentistry, Invisalign clear aligners, dental restoration, and CEREC One-Visit Crowns, he has established a truly world-class dental office in beautiful La Jolla, California, "The Jewel" of San Diego. Dr. Briscoe provides a full range of dental services for patients of all ages. As one of the best dentist San Diego has to offer, he realizes patients want a comprehensive dental practice that can handle all their needs from routine teeth cleaning to the most complex dental implants. Patients with specific requirements for dentistry can rest assured that they will be taken care of. Whether it is overcoming fear, dealing with restricted schedules, helping those with sleep apnea or reassuring children during their early dental visits, Dr. Briscoe’s office and staff are focused on delivering top notch cosmetic dentistry in San Diego. Our friendly staff will welcome you to our comfortable La Jolla Dental Spa. The dental office that Dr. Briscoe has established in La Jolla is modern, friendly and very efficient. While providing you with every possible comfort, from blankets, pillows and massaging chairs to warm facial towels, DVDs, and relaxing music on headphones. For those patients with a fear of dental work, Dr. Briscoe, DDS has developed a highly effective method to put patients at ease, providing among the best sedation dentistry San Diego has available. Dr. Briscoe has even had patients conquer their dental fears altogether after having such a positive experience at La Jolla Dental Care. Patients with anxiety are provided with fully monitored sedation during their visit to ensure patient safety. In this way they can achieve dental health and benefit from the overall increase in confidence that having healthy teeth and gums provides. Our friendly and professional staff will also do the best they can to make sure that your cosmetic dentistry treatment is rapid, as well as painless. La Jolla Dentist, Dr. Briscoe has trained in and uses advanced dental technology, such as our in-house computer-aided dental lab, to make sure that your treatment gets you the exact results that you want. Additionally, patients with very little time can have porcelain crowns, inlays, onlays and veneers using CEREC chair-side technology. This breakthrough computerized system allows Dr. Briscoe to create crowns and veneers in one visit. This is a huge benefit for those who have extremely busy schedules or who travel extensively for business. These computerized crowns and veneers fit perfectly as they are crafted from digital images of the patient’s teeth and bite. Mature adult dentistry is a specialty that addresses the unique problems that those over 50 wish to remedy. A top cosmetic dentist in San Diego, Dr. Briscoe has rejuvenated the smiles of thousands of adults whose teeth have deteriorated over time. If periodontal disease is part of the problem, he helps his senior patients achieve healthy gums as part of the rejuvenation process. Veneers, restorations and dental implants in San Diego, along with teeth whitening, can take years off and restore full confidence to eat and laugh and converse with friends. When you come to see La Jolla Dentist, Dr. Briscoe about your dental care, you won't get a "one size fits all" dental treatment plan. Dr. Briscoe understands that each patient is unique, and that everyone has a different set of concerns, priorities and needs when it comes to having a better smile. "Improving your smile doesn't have to mean getting a full make-over, although we do a lot of that. It can be as simple as whitening your teeth," says Dr. Briscoe. "No matter what you do, something is available to change your smile and that 'something' just might be the easiest youth-restoring action you've ever taken!". Taking his unique approach to each patient, Dr. Briscoe, DDS, has changed the smiles and lives of many of his patients. With years of producing beautiful results, Dr. Briscoe has become renowned as the best dentist San Diego has to offer. Select one of the links below, or click here to find out more about our dental services. Changing your smile can take years off your appearance! Find out how Dr. Briscoe can help you reverse the aging process, without a facelift! Transform your smile in just two or three visits with the finest porcelain veneers available. Replace chipped, stained and even crooked teeth. Are dentures or missing teeth keeping you from enjoying life? You can have comfortable, permanent replacements, with the most beautiful dental implants San Diego has available. No more temporaries and repeat visits. With our in-house computer lab, your new crown will be crafted while you wait. With the revolutionary KOR process, you can get true professional dental whitening that lasts a lifetime. Call us today to schedule an appointment for the finest teeth whitening around!